I'm organizing and scanning thousands of negatives and slides from the Cambia collection, and I'll prioritize my scanning efforts based on the areas of the greatest interest. The picture collections are below, and are continually expanding. Enjoy! If you're browsing through some of the old update pages, you may find that some of the images are missing. As I scan more images, I sometimes find that I have identified the school year of an image incorrectly. At that point, I rename the file and change the numbering of the sequence as necessary. I'm still working on the 4" x 5" film right now, and it appears to be mostly from the 1965-66 through 1970-71 school years. I've been scanning a lot of the larger format negatives from the sixties. It's amazing how much better the quality of these negatives is compared to the newer 35mm negatives. I've also been trying to scan some negatives for the classes that are having reunions this summer. It seems that none of the group shot negatives for the 1996-97 school year are in the collection. There are quite a few "mugs" from that year that I have been scanning. I still haven't been able to find a single negative from the 1976-77 school year. Christina Geabhart sent me a small collection of digital images from the 2004-2005 school year for the Oak Park alumni pages. I also have 80+ unidentified images. A few of them are on the "Mystery Page." I'm looking for a 1966 yearbook with its pages intact. If you have one you could part with for a short time, send me an e-mail. As the collection has grown, the original approach of displaying all images on one page has become impractical. I have changed the image pages so they show a drop-down list of image groups. Select an image group to display all images in that group. This should make it easier for everyone to enjoy the pictures without waiting an inordinate amount of time for them to load. You'll also find a link to the Oak Park alumni information page at the top of each class page. 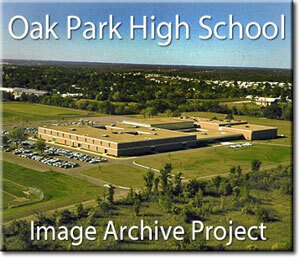 I've scanned a few newer negatives for the Oak Park alumni information pages. I'll be adding more of the newer images in the future, but my current focus is on the older negatives.